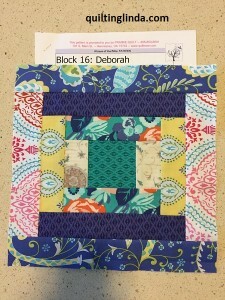 Good Fortune Mystery Quilt – Finished! 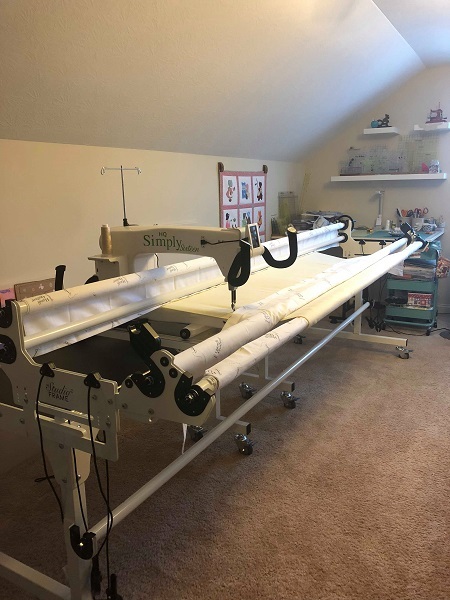 I put the last stitch into the binding on Monday, April 22. 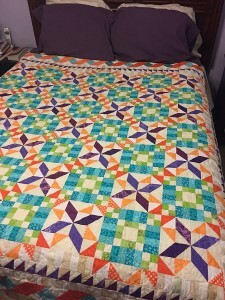 The quilt was loaded on the quilt frame for about a month before I decided how to quilt it. Because it is a very busy pattern, I quilted it with a loopy meandering design. On Monday a group of friends from my quilt guild met at a local library to sew with our Featherweight sewing machines. This was the third monthly meeting of the Featherweight Club. 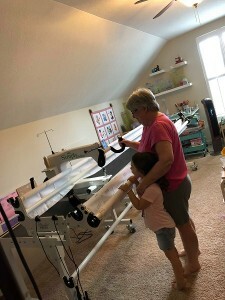 We worked on our own projects, visited, ate lunch, and sewed some more. Owning a Featherweight is not a requirement to join the group and you can work on the project of your choice. I started the morning sewing on my machine. 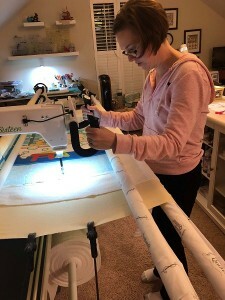 Because I planned to take my Good Fortune quilt to the guild meeting the next day for Show and Tell, I switched to hand sewing the binding in the afternoon. I put the last stitch in the binding just as we were getting ready to stop for the day. 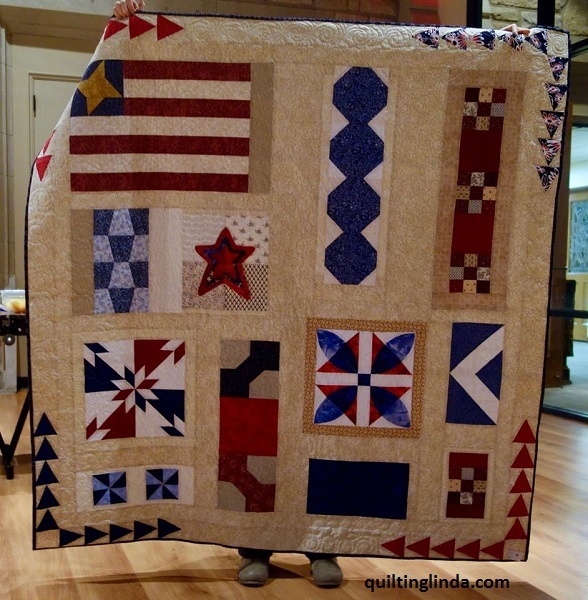 Joining Common Threads Ohio Quilt Guild has been one of the best things I have done since moving to Columbus. I have enjoyed sewing with others again. Looking back, I see that I haven’t posted since clue 4 was released. That is because a nasty virus took over my life. 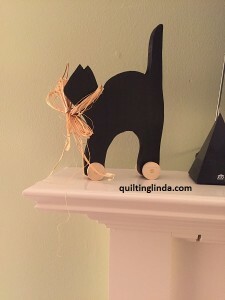 I was too ill to even go upstairs to my sewing room for about two weeks. 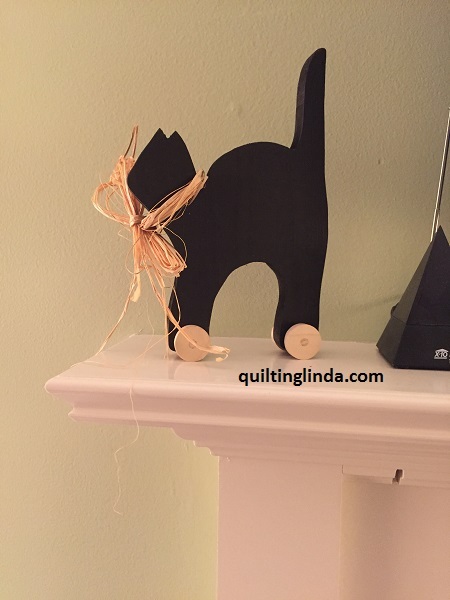 When I felt well enough to start sewing again, it was in small spurts of time. 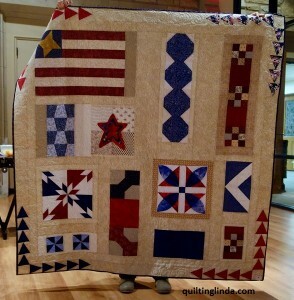 Bonnie revealed the mystery quilt last Friday. I was still working on clue 7 at that time. 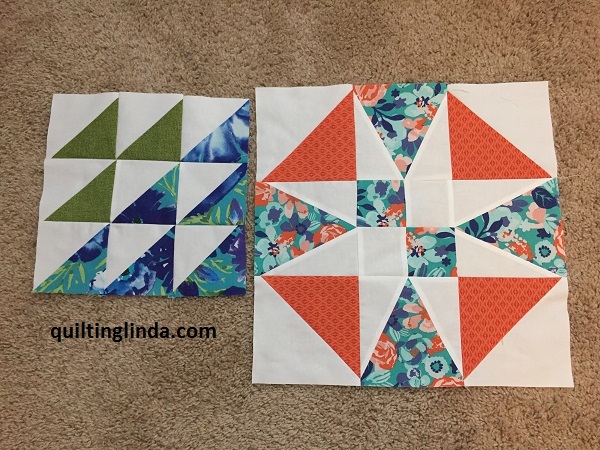 I now have all the center blocks completed and have started working on the pieced borders. 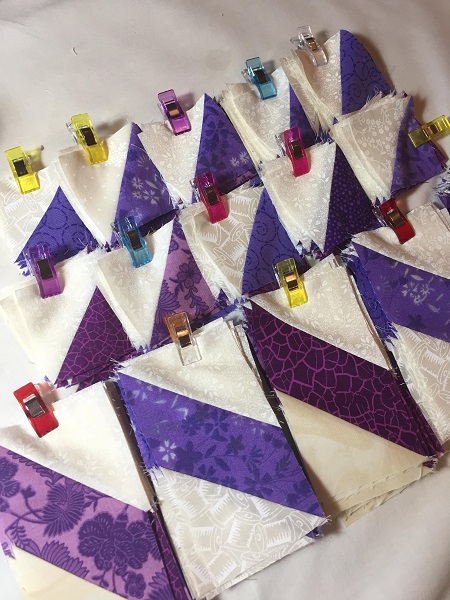 I have all the pieces finished, it is a matter of joining them together. As I stated when the mystery began, I switched colors this year. I used some of the same colors that Bonnie used but switched them around. 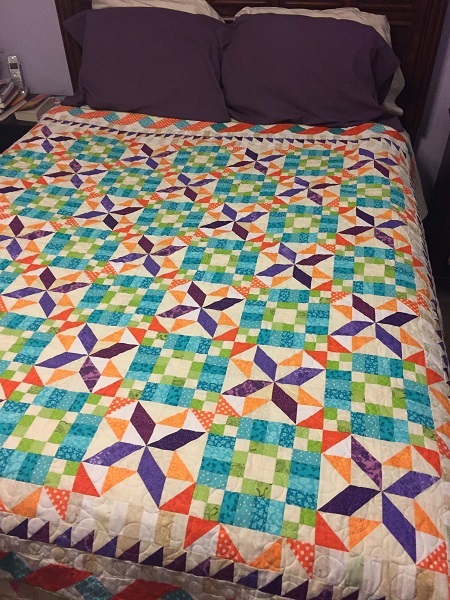 As a result of the switch, my chain blocks are aqua and green and the spinning star is purple and orange. 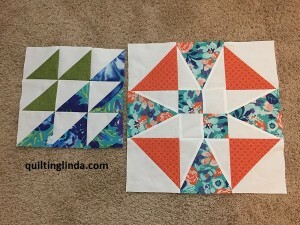 I haven’t joined them together but all of the blocks are completed. This has been another fun mystery quilt from Bonnie Hunter. I will miss getting a new clue each week and watching the progress of others on the Monday Link-up. It is not too late to join the mystery but hurry and download the clues. Bonnie will be removing them from her blog on February 1. They will be available for purchase after that date. 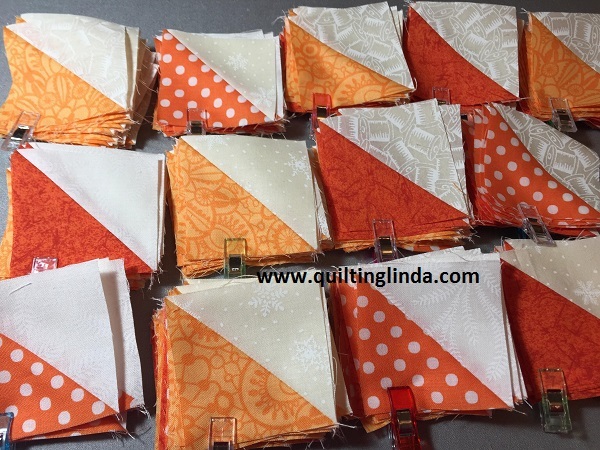 Bonnie Hunter’s mystery quilt continues…. Clue 3 had us making half chevrons and half square triangle (HST) units. The leftover corners from the chevrons were used to make the HSTs. I hadn’t finish this clue before clue 4 was released but I stopped working on it to make strip pieces for clue 4. Bonnie gave instructions for three different ways to construct clue 4. I chose one of the faster and easier methods. I cut strips from aqua fat quarters to make strip sets. 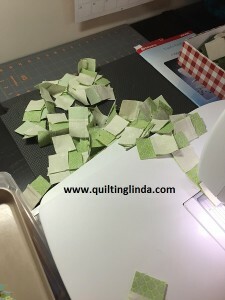 I then cut the size units needed from the strip sets. 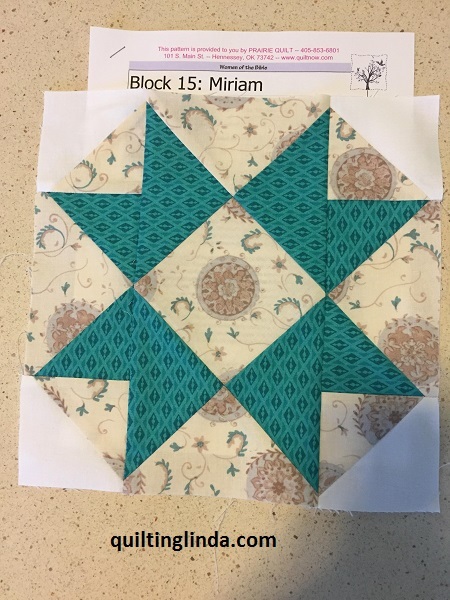 I started and finished clue 4 on Friday afternoon. That evening I finished sewing clue 3 and on Saturday I finished pressing all of the finished HSTs. 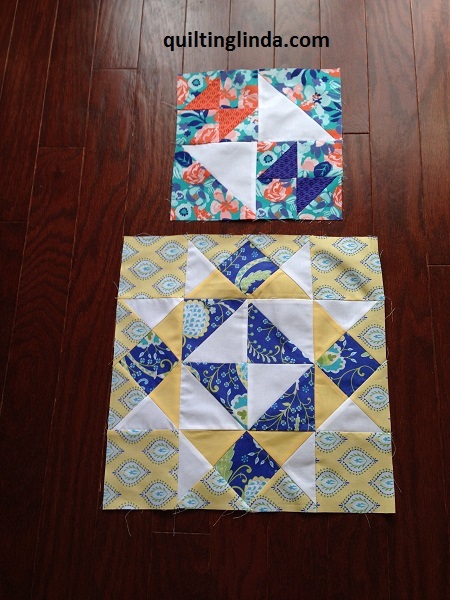 These are my finished pieces for the first four clues. 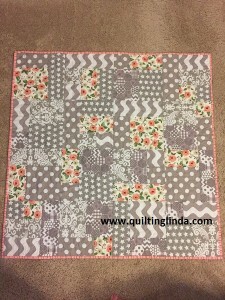 Bonnie has a link-up party on her blog. 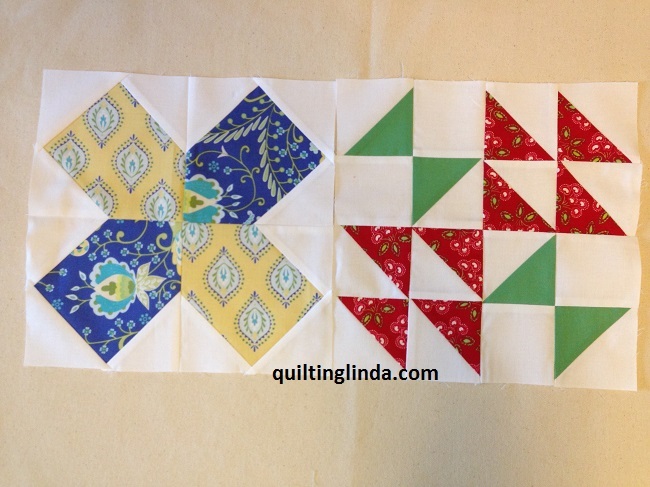 To see the progress of others making the mystery quilt, click the following link. 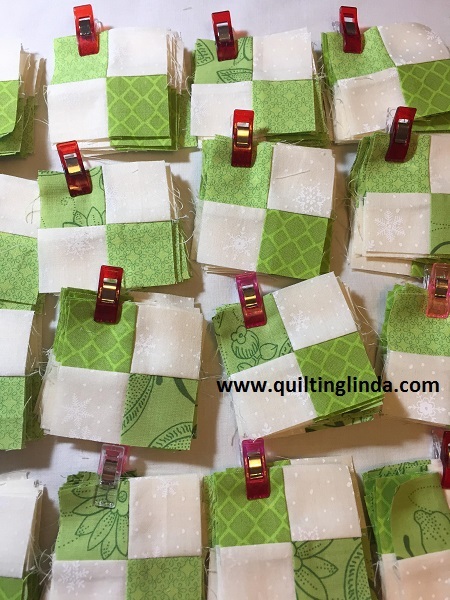 Earlier this month my quilt guild held the annual Christmas party. The plan was to have a gift bag exchange as part of the evening festivities. 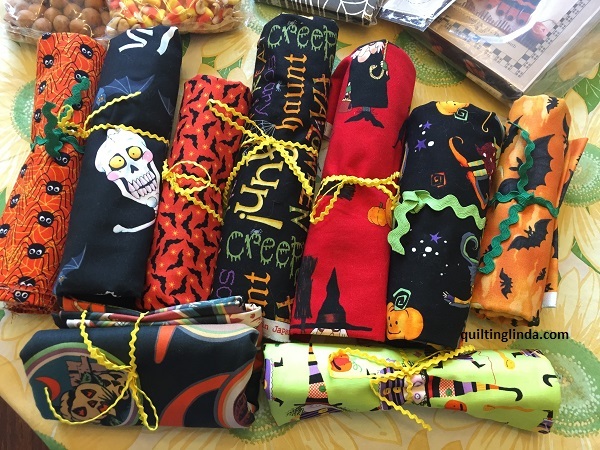 My daughter and I both planned to attend and met at my house to make bags. We happily finished them a few days early and were ready for the party. On the day of party our plans changed and we weren’t able to attend. Since we didn’t attend the party, we each kept our own bag. 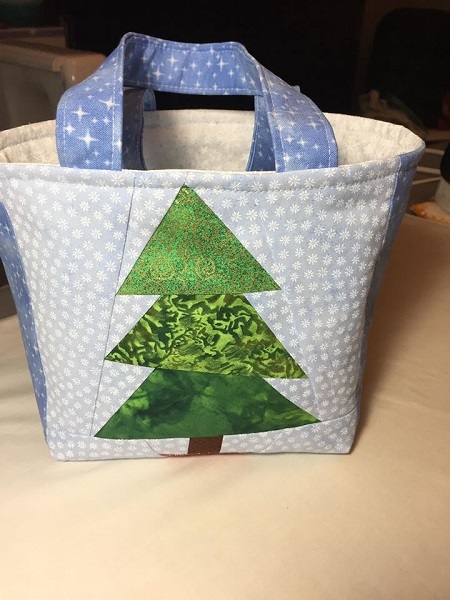 I made a bag with a paper pieced tree. Jennifer’s bag has a paper pieced polar bear. 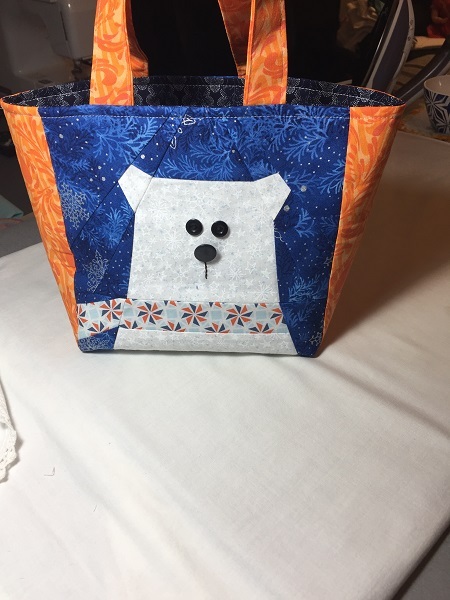 She added buttons for eyes and embroidered a line under the button nose. 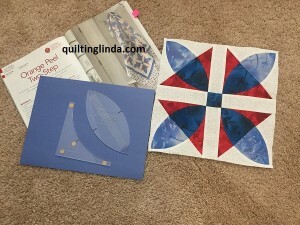 Both of our patterns were from a book she received from her Secret Pat at the quilt guild. 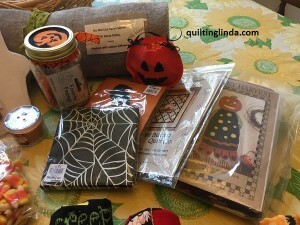 I have made quilts and table runners with holiday themes but I never made a Halloween quilt. When I saw the free Halloween quilt-along at Fort Worth Fabric Studio I decided it was time to make one. I had to go shopping because I did not have any Halloween fabric in my fabric stash. 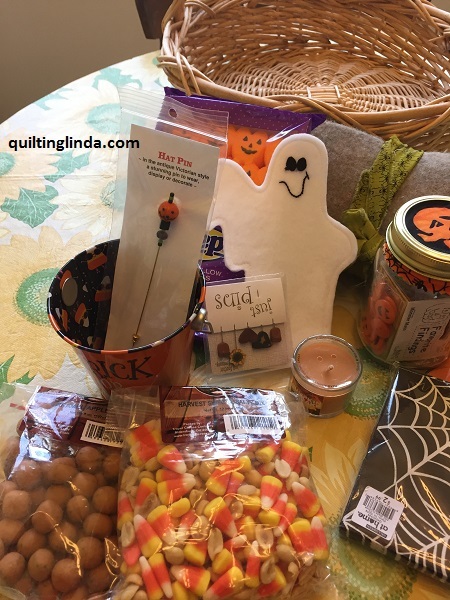 I found some nice Halloween prints of spider webs, glow in the dark eyes, bats, candy corn, pumpkins, and some nice black and orange pin dots. 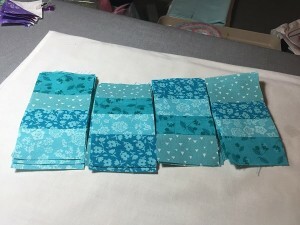 The background fabric has white ghosts printed on the white fabric. 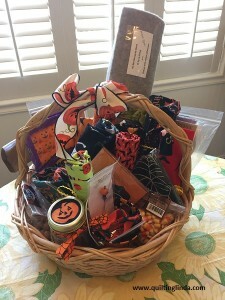 This was all purchased before I won the Halloween basket as shown in my previous post. I am sure there will be another Halloween quilt in the future! 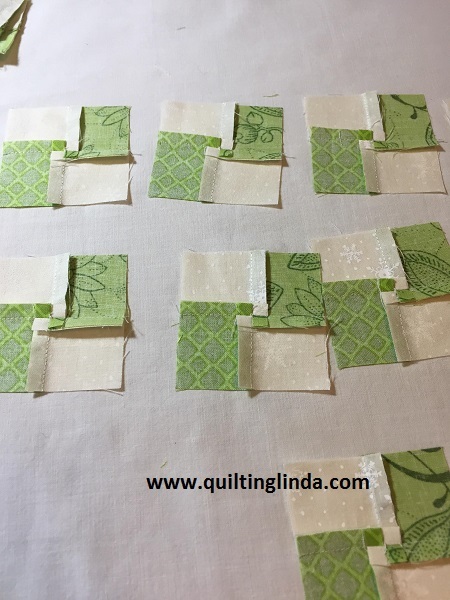 The first clue gave the cutting instructions for the entire quilt. I cut it out and labeled the pieces. I made the blocks as the clues were presented. 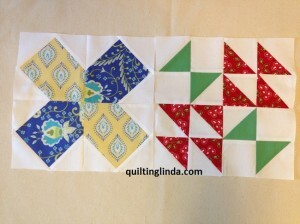 The last clue gave the instructions for assembling the blocks into a quilt top. 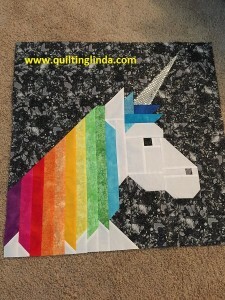 This is a wall hanging size quilt, about 38 inches square. 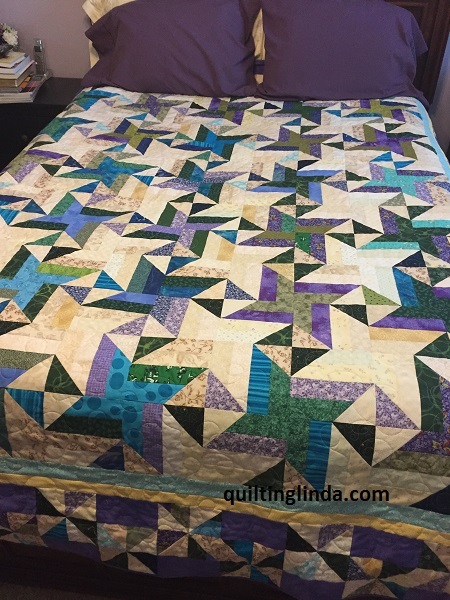 I am trying to decide how I want to quilt it. My thoughts are to quilt pumpkin vines and leaves but am still pondering the design. Do you have a suggestion? 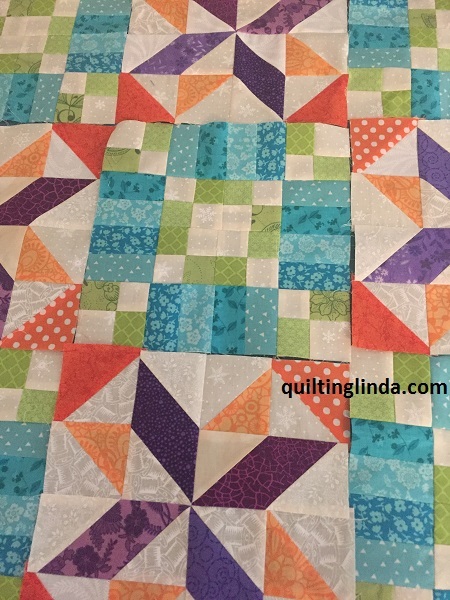 Tell me how you would quilt it in the comments section below. 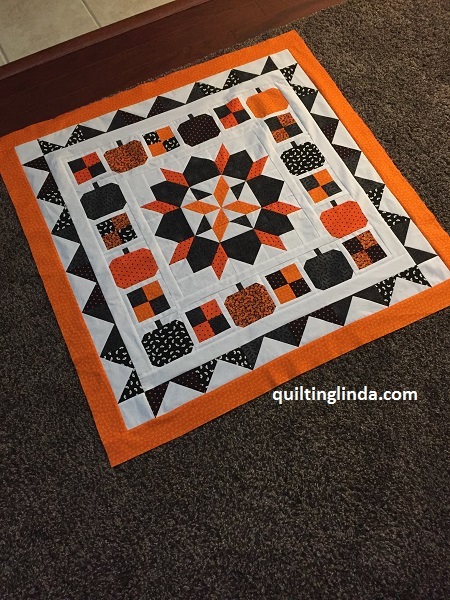 The instructions for the quilt are available here - 2018 Boo to You Halloween Mystery Quilt. The newest blocks in the Women of the Bible series are quick and easy to sew. 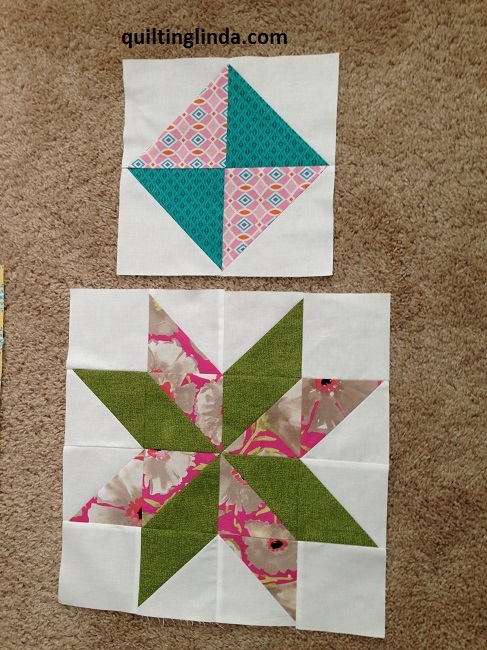 I chose to use less busy fabrics in these two blocks because some of the previous blocks are very busy. 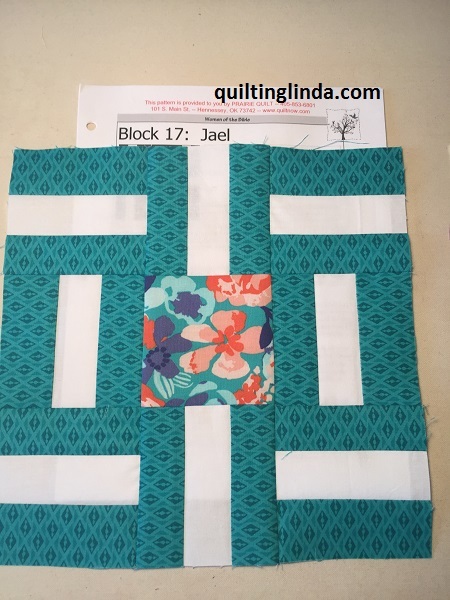 Block 17 is named Jael. She and her husband hid a Canaanite military leader in their home. As he was sleeping, she killed him. Jael was declared a heroine for bringing down an enemy of Israel. 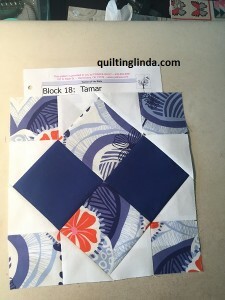 The 18th block in the series is Tamar. The story of Tamar can be found in Deuteronomy 25: 5-6. The stories of some of these women of the Bible are quite shocking. They were heroines in their time but would be considered extremely inappropriate and even criminal by today’s standards. 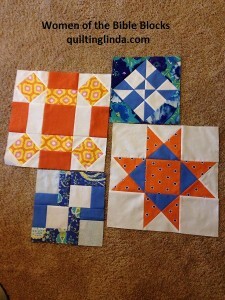 The patterns for these blocks can be found at Prairie Quilt. I made blocks 7 and 8 in February but didn’t take pictures of them until I had completed the next two blocks. Block 7 is Rebekah. The designer of the block said she chose Crosses and Losses to reflect Rebekah’s story. The large light hourglass represents Rebekah, the mother caught between her twin sons, represented by the small dark hourglasses. Block 8 is Ruth, a loyal daughter -in-law to Naomi. 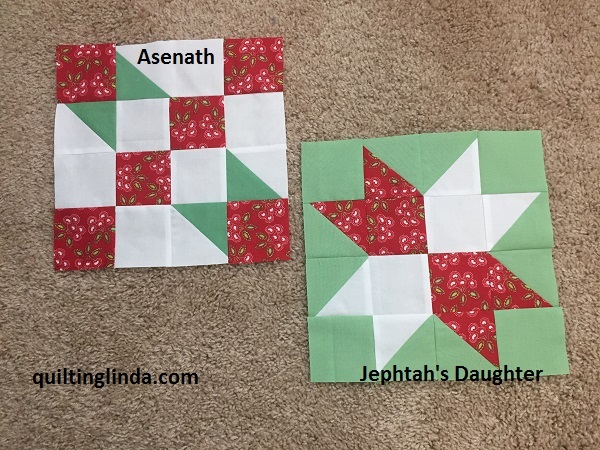 The next two blocks are Bathsheba and Esther. Bathsheba married King David and was the mother of Solomon. Esther was of Jewish heritage and was chosen Queen of Persia. The next two patterns will be available on March 15th. The latest blocks are Hagar and Jezebel. I have added new colors for the Jezebel block. 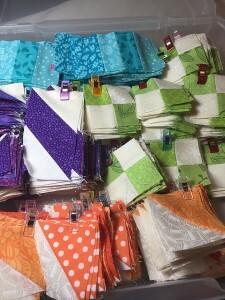 I plan to use all of the colors in my pack of fat quarters which includes pink and more blue and yellow fabric. 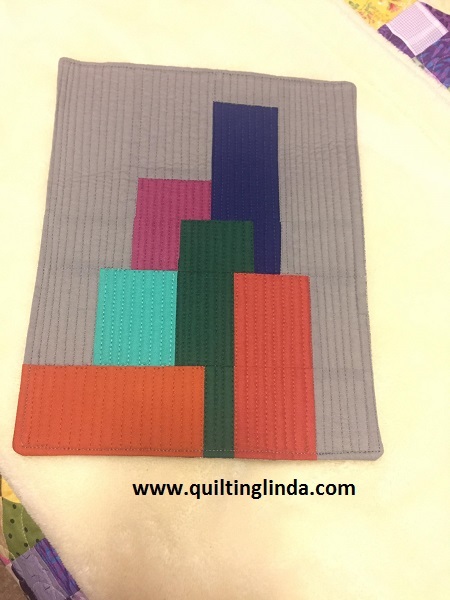 I am using some plain colors that were originally with my 1930s fabrics.